Last month Times Higher Education published the latest World University Rankings (WUR) with the top 1258 Universities in the world. 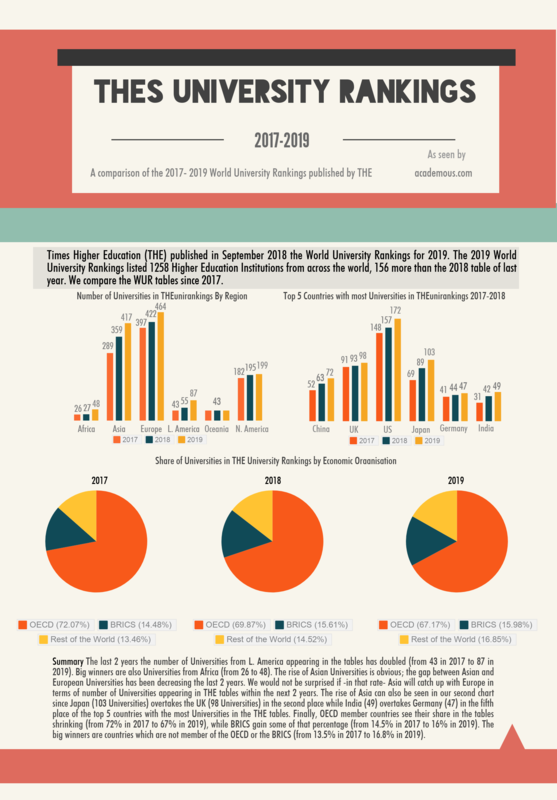 Compared to the last year’s tables, the 2019 World University Rankings include 156 Universities more. We crunched the data and we created an infographic taking also under cosideration the WUR tables of the last 2 years. – In the 2019 tables are represented 85 countries compared to the 80 countries in the 2017 tables. This is also due to the increase of the number of Universities (from 981 in 2017 to 1258 in 2019). – Latin America has seen the number of its Universities double in the tables (from 43 in 2017 to 87 in 2019) within the last 2 years. – Asia is on the rise and the gap between the number of asian Universities and the number of european Universities appearing in the tables is shrinking. If it continues in that rate, Asia may overtake Europe in terms of number of Universities in the tables within the next 2 years. – Japan (103 Universities) is now second behind the US (173) and above the UK (98) in the top 5 countries with the most Universities in the WUR. – India (49) surpassed this year Germany (47) in the number of Universities appearing in the charts. – OECD countries seem to lose some of their market share. 72% of all the Universities in the WUR 2017 tables were in the OECD member countries. In the latest tables only 67% of the Universities are in a OECD member country. And what is a loss for the OECD countries is a -slight- gain for the BRICS (from 14.5% in 2017 to 16% in 2019). The big winner is Universities from the rest of the world (their share grew from 13.4% in 2017 to 16.8% in 2019). Who said Higher Education is not global? Thank you very much for reading! Enjoy!